Bred and owned by Meadow Stable. The story of “Big Red” begins with a 1969 coin toss to determine who got first pick of the foals produced by sending certain Meadow Stable mares to Ogden Phipps’ important sire, Bold Ruler. Phipps “won” the toss and selected a weanling filly, thus leaving the Chenery family’s Meadow Stable with the yet-unborn 1970 foal out of Somethingroyal. By the end of 1972, Secretariat was the first-ever, two-year-old Horse of the Year, edging out Claiborne-raised La Prevoyante in year-end balloting. In 1973, he became the darling of not just horseracing but the entire nation; he won the Triple Crown in record time for all three events; graced the covers of Time, Sports Illustrated and Newsweek; repeated as Horse of the Year; and forever raised the bar by which all Thoroughbreds are measured. Between his two- and three-year-old seasons, Meadow Stable’s founder Christopher Chenery passed away, and daughter Penny Chenery called upon the new master of Claiborne Farm, 23-year-old Seth Hancock, to syndicate Secretariat in order to settle estate taxes without liquidating the farm’s bloodstock. Syndicating a colt who had not yet raced at three, with a record price tag of $6.08 million and contractual terms calling for him to race for Meadow Stables in 1973 was a monumental task, and in a matter of days Hancock pulled it off with established Claiborne clients as well as new investors. Larger than life, Secretariat was more than the “Super Horse” Time magazine dubbed him when he graced its cover. 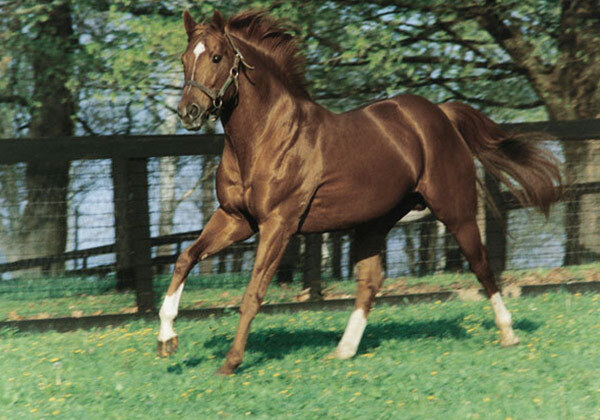 The bright chestnut with three white stockings was the most celebrated racehorse of all time and the only non-human ranked among ESPN’s 50 Greatest Athletes of the 20th Century. Taking over the premier stall at Claiborne, that of his sire Bold Ruler, Secretariat left his enduring mark on the breed first through the exploits of his own sons and daughters (such as dual Classic winner, Risen Star, and Horse-of-the-Year, Lady’s Secret). More emphatically, his impact as a champion sire of broodmares reshaped the breed through some of the most celebrated sires of the last quarter-century, chief among them Storm Cat and A.P. Indy.